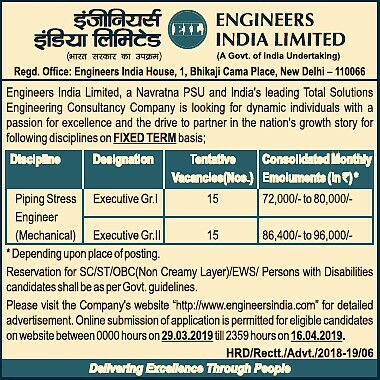 The Engineers India Limited, Is Appointing Eligible People To The Post Of Executive Grade I/II (Piping Stress Engineer, Mechanical). So Interested Can Apply For This Job Through Online Mode, From 29th Of March, 2019, Onwards. Kindly Do Read Out The Official Advertisement For An Accurate Information & Instructions, It's Provided Down Below. Executive Grade I I-15 Vacancies . Total Number Of Vacancies →30 Online Vacancy, Kindly Do Check Out The Image Below For Name Of The Post, Vacancies Distinction & More. (Credit- The Official Advertisement EIL). B. Eligible Criteria For Executive Grade Job Vacancy In EIL Recruitment 2019. Age Limited → Check Out The Full Notice For Age Limit. Educational Qualifications →Degree/Certificates In Concerned Discipline. For More Info →The Official Website Of EIL. Click Here To Apply Online As Well As For Download Notification.